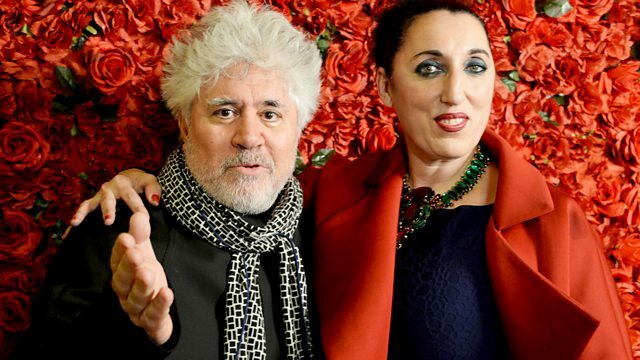 Rossy De Palma on Pedro Almodovar's films. How having a child affects the gender pay gap. Anna Pasternak on Boris Pasternak's lover. Improvisation from pianist Gabriela Montero. This Friday sees the UK release of Spanish director, Pedro Almodóvar's latest film, Julieta. It tells the story of a mother who has been estranged from her daughter for 12 years and women and their relationships are at the heart of the story. Actor, Rossy de Palma, who plays a dour maid in the film and is a frequent collaborator of Almodóvar's tells Jane why she would be willing to play any part that he asked of her, and film critics Karen Krizanovich and Maria Delgado look back over his extensive body of work to explore the representation of women in his films. A new study by the IFS has discovered that the gender wage gap grows year on year after childbirth, eventually reaching a difference of 33% 12 years after a woman's first child has been born. Jane speaks to Robert Joyce, the author of the report. Venezuelan pianist Gabriela Montero will perform Grieg's piano concerto at the BBC Proms on Wednesday night. She joins Jane with a live improvisation for Woman's Hour. Doctor Zhivago, the Nobel prize winning novel by Russian author Boris Pasternak described the life of a doctor and his love for Lara in the turbulent first-half of the 20th century in Russian history. It was made into a hugely successful film in 1965 starring Omar Sharif and Julie Christie. But the book was banned for many years in Soviet Russia and Olga Ivinskaya the woman who was the inspiration for Lara paid a terrible price for her love affair with its author. Jane speaks to Anna Pasternak, great niece of Boris Pasternak whose latest book tells the story of Olga and Boris and why she thinks that in writing it she has "undone an ancestral wrong". And we hear the next in our series of interviews with women who used their creativity to help them through stress or illness. How Does Having A Child Affect The Gender Pay Gap?